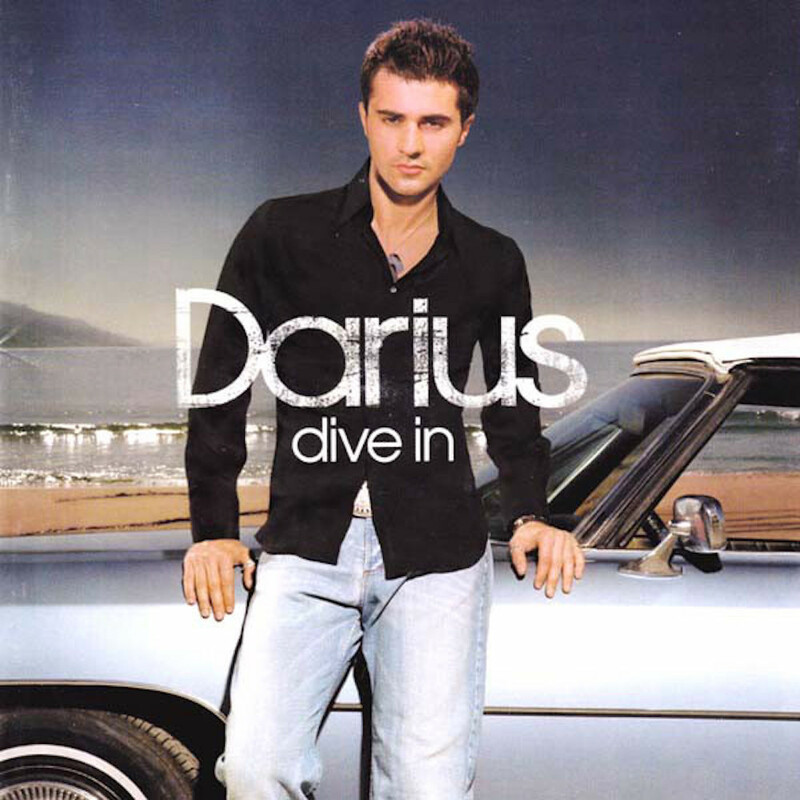 Today’s POP RESCUE from an uncertain fate is the 2002 debut album from Scottish singer and songwriter, Darius, titled Dive In. Whilst Darius’ career route up to this album might be pooh-pooed by those who ridicule the manufactured nature of Popstars and Pop Idol (which does include me, I admit), to his absolute credit, he turned down Simon Cowell‘s record contract offer, and released this self-penned album, in collaboration with producer Steve Lillywhite. A wise move – giving him a hit album and three top ten hits, and a #21 in the UK. The album opens with that debut number one single, Colourblind, an acoustic guitar-led catchy pop song, with Darius’ vocals proving that he’s more than just another Cowell ‘winning’ cover-ballad crooner. The song came complete with a lush video that reminds me somewhat of Jason Donovan‘s Too Many Broken Hearts (it’s the cliff-top strumming bit that seals it). Second single Rushes is up next, and this sees Darius show off a more rockier voice. Once again, we’ve got some great guitar here, complimented by strings, bass, and a number of vocal harmonies. Whilst not as catchy as Colourblind, it’s still a great track. This track reached #5 in the UK singles chart. Next up is third single Incredible (What I Meant To Say), and this song feels like something you’d find on the Natalie Imbruglia debut album. It’s a slick production musically and lyrically. Again, it comes complete with a string section. It has a fairly catchy chorus. Fourth and final single Girl In The Moon is up next. This feels like something that might have been written for him by Noel Gallagher, but it certainly isn’t. Darius manages some lovely warm vocal harmonies. This song reminds me musically of William Orbit‘s collaborations with Madonna and All Saints. Acoustic guitar again leads you into the next track – I’m Not Buying. This is a fairly mellow song, and again i’m hearing Natalie Imbruglia, but this isn’t really the most inspiring song. Reading the sleeve notes, I notice that Kye Sones (formerly of Diagram Of A Heart) gets a backing vocalist credit – he would go on to star in the ninth series of X Factor. Title track Dive In is up next. It opens with some growly guitars and an upbeat bassline and beat, before switching over to Darius singing with bassline and piano. This really shows off his voice perfectly. This is quite a catchy track, and it keeps its pace, thanks to lots of extra percussion in the chorus. Gotta Know Tonight follows this, and this includes some brooding strings, overlaid with acoustic guitars. Darius’ vocals here are warm, and they lift the song in the chorus as the song builds up and up. This is a really good song. What sounds like an underground train, opens next track Sliding Doors. This track does sound different from its predecessors – with near garage style acoustic guitars and strings in the verses. The song ends with the underground train speeding off again, the sound of coins and Darius saying ‘cheers, mate’, and you realise that the song pitches him as a busker watching people on the underground. I really like this song. Simple Like The Truth sounds vaguely familiar, but I can’t quite put my finger on where I recognise the melody. This is a slow ballad, and one that again gives Darius plenty of space to show off his vocals. The backing vocalists, strings, beats and guitars mostly keep out of his way. Tenth track Better Than That was co-produced and co-written by Darius and Blur bassist Alex James. This is a fairly catchy track, and one that feels musically stronger than some of the earlier songs. The verses make me think a little of Craig David, but the chorus really makes it. This leads into Mocking Bird, which is an up-tempo track, with some great vocals and fast acoustic guitar over a chugging bassline. This could probably have been a hit single – and it feels a shame that this is tucked away on an album. The final track listed on the artwork is Mercury Rising, which starts off really light and gentle with a synthscape and delicate acoustic guitar. Darius matches this with his vocals as the song begins to wake up. At times, it makes me think of something by William Orbit – due to its intricate delivery. At about 3m 15, electric guitar and a stronger beat comes in. About a minute later it’s gone again, and we’re back to the delicate sounds and a light few ‘oohs’ from a backing vocalist before it ends. ..then, 57 tracks later, at track 69, is Gotta Know Tonight (Demo) tucked away at the end. Apparently this was included to show what the song sounded before the producers got their hands on it. The track is piano-led, with Darius’ vocals sounding most like Marti Pellow here than anywhere else on the album. This is a really nice version of the song, and certainly well worth skipping through those 57 tracks that separate it from the rest of the album. The albums entire first four tracks make up the singles, with the remaining 8 (plus 1 secret track) being standard album tracks. I’d have probably spread the singles out, in a bid to make the listener have a more familiar first few plays as the latter part of the album doesn’t particularly vary very much… but what you do hear is perfectly listenable. I’m glad that he got a hit out of it. Darius went on to record a second album in 2004, before hitting the West End with numerous long-running performances in shows such as Guys and Dolls, Gone With The Wind, and Carmen. He has also appeared in several TV shows. He is also an ambassador to The Prince’s Trust. 2002 UK CHART POSITION: #6, certified Silver. POP RESCUE COST: £1.49 from an Age UK store. Posted in 2000s, DariusTagged 2002, album, Alex James, Colourblind, Darius Campbell, Darius Danesh, Dive In, Kye Sones, Pop Idol, Popstars, review, Rushes, Simon Cowell, Steve LillywhiteBookmark the permalink.